Josh Rosen is a quarterback for the Arizona Cardinals in the National Football League (NFL). Even though Rosen is still in the infant stages of his career, he is already creating the records and stats that alludes to him going on to become a bona fide NFL great in the not-so-distant future. Get to know more about this talented young man here including his girlfriend, body stats, professional career, and his illustrious family. Josh Rosen, full name Joshua Ballinger Lippincott Rosen, was born on the 10th of February 1997 in Manhattan Beach, California. As a child, he favored the game of tennis and was very good at it. He started playing tennis at the age of 5 and by 12, he had become one of the best tennis players in his age group in Southern California. Rosen, however, would fall in love with football, thanks to the influence of a friend’s dad and switched to football in high school. He had his high school education at St. John Bosco High School in Bellflower where he excelled not only on the field of play but also in his academics (his GPA in high school was an awesome 4.3). In his four years of high school football, he completed 525 of 840 pass attempts (63%) for 8,473 yards and 90 touchdowns and led his school to multiple titles in his junior year. Coming out from his senior year in 2014, Josh Rosen was a highly rated quarterback. Scout.com named him the No. 1 QB in the country while ESPN.com named him the No. 2 QB in the country. USA Today also named him a first-team All-American. Given all these top ratings, it was no surprise that the quarterback was heavily sought after by several colleges but he picked the University of California, Los Angeles. At UCLA, Josh Rosen immediately got to work, participating in spring practice as well summer camp. The coaches rewarded him by naming him the starting QB for the season-opening game, making him the first true freshman to start a season-opener at QB in the school’s history. Rosen did not disappoint as he led the school to victory in that game, completing 28 of 35 passes for 351 yards and three touchdowns. Overall, Josh Rosen completed 292 of 487 pass attempts (60.0%) for 3,669 yards, 23 touchdowns and 11 interceptions in his debut season. As a testament to his excellent rookie season, he was named the Pac-12 Conference Offensive Freshman of the Year (coaches) and Pac-12 Newcomer of the Year (AP). He also earned first-team freshman All-America honors from USA Today, FWAA and Sporting News. The California native continued his impressive form for the next two seasons amassing a UCLA career total of 712 of 1,170 pass attempts for 9,340 yards and 59 touchdowns. In doing this, he created several records. He holds the UCLA records for most 300-yard outings (17) and most games with 350+ passing yards (10). He also holds the record for most consecutive games with at least one touchdown pass (14). Rosen called time on his college career after three years and declared for the 2018 NFL draft. He was picked in the very first round of the draft by the Arizona Cardinals and was the 10th overall pick of that year. The Cardinals signed him to a fully guaranteed four-year contract worth $17,597,756. So far, Josh Rosen is living up to expectations and proving to be money well spent. 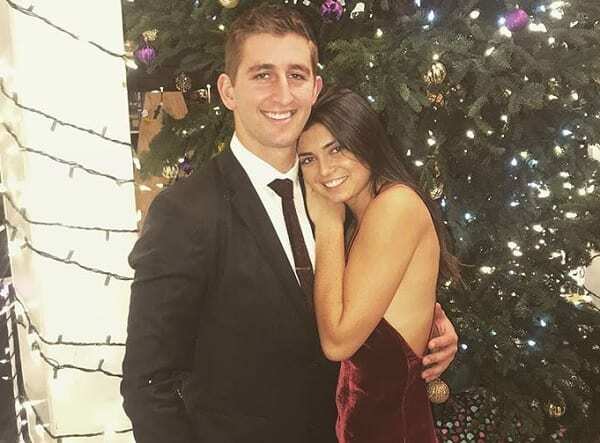 Josh Rosen has a girlfriend and her name is Zana Muno. Zana is a California native and also a student of UCLA. They reportedly started dating in 2013 and just like her man, Zana is an elite athlete. She plays college volleyball and was part of the UCLA team that won the 2018 women beach volleyball national championship. He hails from an illustrious, affluent and well-educated background. His background nearly scuttled his dreams of being drafted as some felt that he was arrogant and cocky. His dad, Charles Rosen is a renowned spine surgeon who was once considered by former US president Barack Obama for appointment as the country’s surgeon general. His mom, Liz Lippincott is a Princeton alumnus and a well-accomplished editor. Rosen’s parents divorced in 2012 and he remains close to both of them. Asides from his parents, he has two sisters who are also gifted athletes. They are, Beatrice who played tennis at Emory University and Lydia who is an excellent high school rower. Additionally, Rosen’s mom, Liz is the great-great-granddaughter of Joseph Wharton, the industrialist who founded the renowned Wharton Business School at the University of Pennsylvania. Liz is also a descendant of Joseph Ballinger Lippincott (Josh Rosen is actually named after him), founder of J.B. Lippincott & Co. publishing house. Rosen comes from a Jewish family. He had his bar mitzvah when he was 13 and identifies as Jewish. He, however, maintains that he is open-minded as far as the issue of religion is concerned. Also, he regards himself as a torchbearer for Jewish people in the sporting world seeing as there are few Jewish professional athletes. Rosen is 6 feet 4 inches tall and weighs a modest 218 lb or 98 kg. He has an arm length of 313⁄4 inches and a hand size of 97⁄8 inches. He is an extremely intelligent and confident player who has the necessary accuracy and poise to become a star quarterback in the NFL.